Sree Vidyanikethan Engineering College, Chittoor has advertised in THE HINDU newspaper for recruitment of Professor / Associate Professor / Assistant Professor / Librarian jobs vacancies. 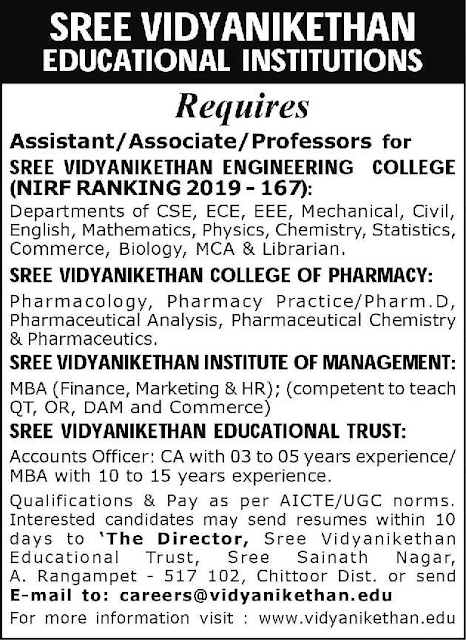 Interested and eligible job aspirants are requested to apply within 10 days from 17th April 2019. Check out further more details below. About College: Sree Vidyanikethan Engineering College was established in 1996 by Sree Vidyanikethan Educational Trust under the stewardship of Mohan Babu, a film artist and former member of Rajya Sabha.The college is situated in lush green and scenic surroundings, 14 km from the famous temple-town of Tirupati.